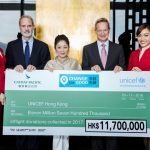 The Cathay Pacific Group and the Hong Kong Committee for UNICEF (UNICEF HK) announced that a total of HK$11.7 million was raised from the Change for Good inflight fundraising programme in 2017. Since its launch in 1991, the programme has successfully converted spare change from Cathay Pacific passengers into supplies and services to improve the lives of vulnerable children worldwide. Of the total donation in 2017, Cathay Pacific has designated HK$2.73 million to support UNICEF’s Schools for Asia programme in Myanmar and India. The thematic programme, which aligns with one of the airline’s key community engagement endeavours of promoting youth development, aims to provide quality and sustainable learning for children. There is a particular focus on disadvantaged children who are less likely to receive education because of their gender, ethnicity, disability, geographic location or economic circumstance.